Ever since its introduction in the late 1950s, the B-52 Stratofortress has been the United States' primary heavy bomber and a powerful symbol of its immense military might. 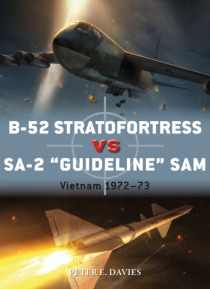 Its powerful electronic countermeasures equipment (ECM) was thought to make the B-52 immune to ground-to-air missile attack, but in Vietnam, and later conflicts such as Operation Desert Storm in 1991, it came up against the Sov… iet-designed SA-2 SAM which used heavy salvoes of missiles to bring down the bombers.The losses of several of its most feared, powerful and supposedly invincible bombers per night to a torrent of Soviet missiles during the closing stages of the Vietnam War was sobering to Americans, but the B-52s' crushing attacks virtually eliminated North Vietnam's defences and forced a peace settlement. This fascinating book analyses the roles of the SA-2 operators and the B-52 Electronic Warfare Officers (EWOs) using specially commissioned artwork as well as first-hand accounts, and traces the cat-and-mouse tactics that each side employed.